SARAJEVO, Bosnia, October 30, 2013 (ENS) – Large areas of land across Bosnia still need to be cleared of mines and other munitions before the rural population can move around freely. The village of Krupac lies to the south of Sarajevo, on the road to Mt. Bjelasnica. During the 1992-95 war, Krupac was right on the front line dividing the armies of the Bosnian government and the Bosnian Serbs. Slobodanka, an elderly resident of Krupac, showed reporters a minefield marked out with yellow tape near her home. Before the war, she used to roam the area looking for medicinal herbs and what says are the tastiest wild strawberries in the world. “I don’t dare go there any more, although I’d love to. The area is mined and it’s very dangerous,” she said. Slobodanka spent the entire war in Krupac, living in a no-man’s land where she had to brick up most of her windows to stop sniper bullets. Nearly two decades after the end of the war, landmines and other munitions still pose a threat to life and limb across Bosnia. Goran Zdralo of the Bosnia and Herzegovina Mine Action Centre, BHMAC, a government agency that coordinates all landmine clearance in Bosnia, recites some grim statistics. 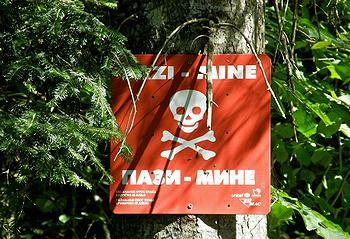 “Mines and unexploded bombs have killed or injured 8,293 people since 1992. Since the end of the war [in 1995], 1,708 people have fallen victim to mines and unexploded bombs; 597 of them were killed. In 2013, there were 13 casualties, three of whom sadly died,” he said. Since 1995, around 2,900 square kilometres of land have been cleared of explosive materials. However, between 1,250 and 1,300 square kilometres – 2.5 percent of Bosnia’s territory – is still assessed as high-risk and in need of thorough checking followed by clearance where mines are identified. Zdralo says the highest-risk zones are located where the lines separating the warring armies once ran, and include the municipalities of Velika Kladusa, Orasje, and Doboj. Figures from 2012 indicate that 540,000 people in Bosnia are living in areas where the proximity of landmines and unexploded munitions poses an immediate threat to life. BHMAC officials say the biggest danger comes when people ignore stern warnings and knowingly trespass on marked-out minefields in order to gather firewood and other materials. Stipe Bulic, a professional mine clearance expert working from Livno, says anyone out in the countryside needs to exercise great caution. “Erosion, extreme weather conditions, fires and other things often trigger explosions of mines and unexploded ordinance, endangering lives,” he said. The risks are even greater for demining personnel like Bulic who put their lives on the line every day. Bulic broke his arm in an incident 10 years ago. Since 1996, 115 deminers have been involved in accidents, and there have been 46 fatalities. “Eighteen years after the war, mines and explosives are still present and they represent a huge threat and danger not just to the civilian population, but to those us who work on demining and destroying explosives,” Bulic said. The team he works with specialises in destroying landmines, artillery shells and other munitions once they have been found. They crate up the live explosive devices and move them to the designated destruction site, where specialists clad in body armour, helmets and protective boots attach plastic explosives and a detonation mechanism. A cable is run to a shelter 100 metres away, from where the detonation switch will be pulled. Medical staff are on hand, but withdraw to a safe distance and maintain contact by radio because of the danger of flying shrapnel. If there is a road nearby, police stop the traffic until the blast goes off. Afterwards, the team has to go back and check that all the munitions have been destroyed. If any are still intact, the whole process has to be repeated. As Bulic points out, caution and focus are of the essence, as any mistake is one too many in this line of work. “The fear is there, of course, but we rely on our experience,” he said. The deminers work an eight hour day, with mandatory 10-minute breaks every half hour, plus 30 minutes for lunch. “It might look like the standard working day of any other worker, but is it really?” said Nermina Halvadzija, a nurse who worked with the Italian demining group Organizzazione Umanitaria per l’Emergenza (INTERSOS) in 2009. This vegetation has to be removed before the search for explosive devices can begin, using hand-held probes. As Nail Hujic, a technical director at INTERSOS, explained, this is a massively labor-intensive and delicate task. “In order for deminers to check one square metre, they have to probe the ground around 2,500 times, 20 centimetres deep at an angle of 30 degrees. On average, one deminer will cover 50 square metres a day,” Hujic said. “The arduous nature of the work is exacerbated by the deminers mostly working in a semi-squatting position weighed down by 25 kilograms of equipment [armor], often in extreme temperatures which is even more exhausting,” he said. The deminers are constantly having to assess what type of munition they are dealing with, how it is lodged in the ground, and the possibility of deliberate traps laid by whoever planted the landmine. Nurse Halvadzija now provides preventive training for demining personnel, and she argues that this needs to take place all the time, both when staff are working and when they stop for the winter. “It is statistically proven that this [training] eliminates the most common cause of accidents. Another equally important protective measure is self-discipline. Unfortunately, not enough attention – or to be more accurate, not enough funding – is assigned to such preventive measures,” she said. The commonest motive for becoming a deminer is simple economic necessity. 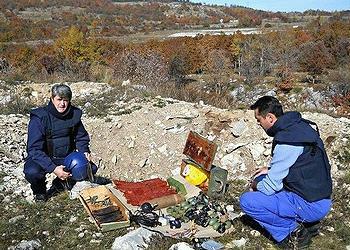 The Bosnian government’s Mine Action Strategy for 2009-19 envisages clearing all unexploded devices by 2019. At BHMAC, the agency responsible for coordinating the effort, Zdrale warns that funding shortfalls could make that aim impossible to achieve. 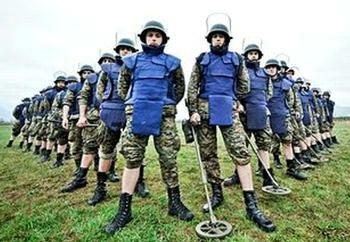 Mine clearance in Bosnia is funded partly by government and partly by international donors, whose money is channeled through the Slovenia-based International Fund for Demining. To date, 80 percent of demining work has been carried out by international NGOs and private firms, and the rest by the Bosnian military.